According to the World Health Organization vaccines aren’t to blame for the spread of Polio in Nigeria; but rather low vaccine uptake amongst the poorest communities. This despite the fact that, by their own admission, children receiving LIVE POLIO VIRUS DROPS will continue shedding the virus amongst their family & neighbors for weeks to come. The madness of “herd immunity”, the assumption that by vaccinating (infecting) everyone the herd will somehow maintain overall protection against life threatening diseases & viruses. This inverted logic serves only one agenda, that of a sustained Eugenics directive throughout the Third World. Since the introduction of this program Polio numbers have exploded in these isolated communities. The locals know full well it is Malaria (coupled with crippling poverty, a lack of proper sanitation & nutrition), NOT Polio which presents a genuine threat to their communities. The only solution – a radical upgrade of sanitation, hygiene & nutritional standards throughout these communities; not more mass vaccinations programs which spread otherwise dormant diseases to poor remote regions. You’ll never see the UN funding that type of a project in any Third World Nation. It would actually save lives & put them on a road to real long-term independence. Eugenics is always couched in “humanitarian” forms of deception. ‘A mutated virus from the oral vaccine used to prevent the spread of polio in Nigeria has paralyzed at least 124 children in the West African country this year. The new figure is double the 62 vaccine-derived cases reported in the country last year, and marks the continuation of the longest vaccine-derived polio outbreak ever seen, beginning in 2006, according to Oliver Rosenbauer, spokesman for World Health Organization’s Polio Eradication Initiative. The oral vaccine contains weakened live polio virus to build immunity in the patient, but can spread from a vaccinated person to the unvaccinated public and grow more virulent. If it is not contained and is allowed to mutate for months, it can grow strong enough to cause paralysis. “Where you get vaccine-derived cases is in communities where the routine vaccination is very low,” said Robert Scott, chair of the International PolioPlus Committee of the Rotary Foundation. Rotary International, the WHO, and the Centers for Disease Control and Prevention are part of a consortium of groups that support Nigeria’s immunization drive. “In this particular case in Nigeria, they stopped vaccinating for almost a year, so large areas were unvaccinated,” Scott said. “I was told by this preacher that when the government introduced the National Immunization Days in 1997, most of the children after vaccination started dying. The preacher told me that they had so much death that his cassock, that he wears to go and conduct the burial ceremony, got old. He said “I buried the children and my cassock got old.” In the same room there was one mother who had four children, and she hid one and took three other children for vaccination, and three children died and that one survived. Now when I went to do my presentation and I asked most of the people who were there – about two, three thousand people – each person had the same story. UPDATE: The UN (Unicef) are continuing their misguided Polio program by reaching out to war ravaged communities in Iraq. “The Salk vaccine failed completely. And the Sabin vaccine was a disaster. It caused many cases of polio and showed no relationship to the disease except for an increase in polio during the early ’60s, caused by the vaccine itself. And now we have the sensational findings from the Annals of the New York Academy of Sciences, which strongly indicate that polio did not go away at all, but now manifests itself as chronic fatigue syndrome. “Many here voice a silent view that the Salk and Sabin vaccine, being made of monkey tissue…has been directly responsible for the major increase in leukemia in this country.” Frederick Klenner M.D., F.C.C.P. ‘Myalgic Encephalomyelitis (abbreviated ME) is a chronic, inflammatory, primarily neurological disease that is multisystemic, affecting the central nervous system (CNS), immune system and cardiovascular system, the endocrinological system and musculoskeletal system. ME can cause a wide variety of symptoms, including changes in sensory tolerance, visual problems, exertional muscle weakness, difficulties with coordination and speech, severe fatigability, cognitive impairment, problems with balance, subnormal or poor body temperature control (due to circulation issues) and severe pain. ME will cause a degree of impaired mobility and disability in all cases. The degree of impairment and complexity depends on the degree of diffuse brain injury and end organ involvement. New Controlled Study finds polyomavirus infection in postmortem brains of sufferers of Autism (inter-generational cross infection from Salk & Sabin Polio inoculations) – 67% infection with Simian Virus (SV40). ‘SV40 is a poliomavirus with double-stranded circular DNA…Important roles of the early proteins in TSG, oncogene and growth factor regulation…SV40Tag can bind to and inhibit p53 and pRb TSGs, and SV40tag has been shown to inhibit PP2A, which may lead to the activation of Wnt and ERK signaling pathways. SV40 infection may also increase autocrine and paracrine signaling through a variety of growth factor pathways and induce the expression of telomerase. SV40 infection may increase the transcription and activation of Notch–1, which may have an important role in mesothelial cell transformation and proliferation…in vivo evidence from mesothelioma samples. 10 out of 11 tumors with detectable SV40Tag expression also stained positively for activated Akt (protein kinase that plays a key role in multiple cellular processes such as glucose metabolism, cell proliferation, apoptosis, transcription and cell migration). ‘For four decades (currently five), government officials have insisted that there is no evidence the simian virus called SV40 is harmful to humans. But in recent years, dozens of scientific studies have found the virus in a steadily increasing number of rare brain, bone and lung-related tumors – the same malignant cancer SV40 causes in lab animals. Even more troubling, the virus has been detected in tumors removed from people never inoculated with the contaminated vaccine, leading some to worry that those infected by the vaccine might be spreading SV40. In recent years more than 60 scientific studies have found SV40 in rare human brain, bone and lung-related cancers, the same kinds of tumors the virus caused in laboratory animals. Some scientists believe SV40 may play a role in causing those cancers. One of the biggest mysteries, however, is why SV40 has been found in tumors removed from people who never received the contaminated Salk vaccine. Researchers have several theories for how the virus could have spread from those infected through the Salk vaccine: in transmission from mother to fetus or through breast milk; through sexual activity or a flu-like virus. But the Lederle documents, which were obtained by Philadelphia attorney Stanley Kops in litigation not related to SV40, raise the possibility the virus might have been transmitted by contaminated oral vaccine, licensed for production in 1962. The two memos added that testing was unnecessary because later vaccine samples submitted for license were free of SV40. Kops also said that he had taken testimony in 1998 from a top Lederle official who said the company did not have the test results from many of the vaccine lots. “The vaccine manufacturers and the government need to disclose what really happened,” said Kops. “Without the facts, (scientists) will continue to look in the wrong places to explain how people were infected with SV40 after 1961.” Lederle did not respond to requests for comment. Last year (2000), a lawsuit was filed in Los Angeles against Lederle by the parents of 2 1/2-year-old Alexander Horwin who died of a brain tumor that later tested positive for SV40. The suit claims that the tumor was caused by SV40 and that he became infected through a 1997 oral polio vaccine. Kops and attorney Donald MacLachlin represent a New Jersey family that is considering a suit against vaccine manufacturers. 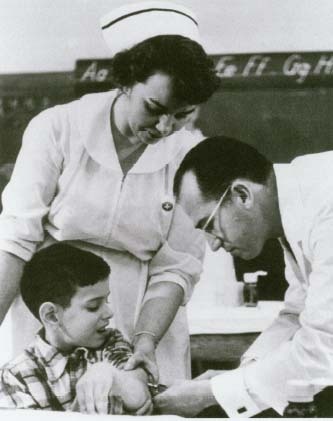 In 1970, surgeons removed a large brain tumor from 2-year-old Mark Moreno. He since has undergone five more surgeries and now wears a protective helmet over the large opening in his cranium where bone grafts never took. Moreno, now 33, lives with his mother and requires daily assistance. Recent tests show Moreno’s tumor was riddled with SV40, according to the lawyers. Eileen Moreno, Mark’s mother, believes her son’s brain tumor was caused by SV40 and that he was infected through the oral polio vaccine in 1968. Last year (2000), two investigators from the U.S. Food and Drug Administration used genetic testing to examine 30 samples of bulk oral polio vaccine used in the United States going back to 1972. They reported finding no SV40. But the government has not used the genetic tests to determine whether vaccine made prior to 1972 was contaminated. * Mesothelioma, a fatal tumor of the membrane surrounding the lungs. Few cases were reported prior to 1950, but the incidence has grown in the United States to 2,000 to 4,000 cases …a year, with greater incidence in Europe. * Brain cancers: Primarily ependymomas and choroid plexus tumors, but also astrocytomas, glioblastomas, medulloblastoma, and meningiomas. Fewer than 1, 000 cases of these cancers are reported in the United States each year. ‘Michele Carbone of Loyola University Medical Center in Chicago has announced results that suggest the Soviet polio vaccine was contaminated after 1963, possibly until the early 1980s. “Is there infectious virus? The short answer is, yes,” Carbone told the Vaccine Cell Substrate Conference 2004 in Rockville, Maryland, last week. The vaccine was almost certainly used throughout the Soviet bloc and probably exported to China, Japan and several countries in Africa. That means hundreds of millions could have been exposed to SV40 after 1963. The consequences of exposure to the virus (which is not related to HIV in any way) are unclear. There is evidence is that some of the people given contaminated vaccines were infected by SV40, and that such infections might lead to the development of certain rare types of cancer many years down the line. But the link with cancer has neither been proved, nor shown to be false. “There are two scenarios,” says Philip Minor of the National Institute for Biological Standards and Control in the UK. “One is that it doesn’t matter. The other is that it does.” Minor found three samples of the Soviet oral polio vaccine from the late 1960s in the NIBSC’s freezers, the only samples known to survive from this time. In 1999, he found they tested positive for SV40, whereas British samples from this period did not. “But we did not draw any broad conclusions,” Minor says. 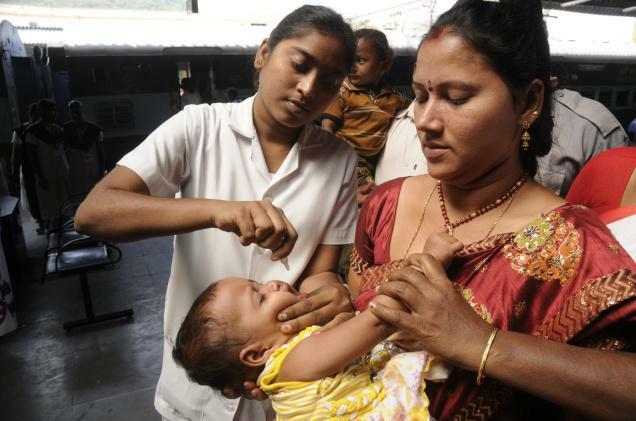 ‘Medical experts in paediatrics in the country have lambasted the World Health Organisation (WHO) and the Bill Gates Foundation for trumpeting India’s polio eradication campaign which they knew 10 years back that it was never going to succeed. ‘India was taken off the list of polio-endemic countries by the WHO on January 12, 2012 but the polio eradication campaign will have to be continued in some format for ever. The long promised monetary benefits from ceasing to vaccinate against poliovirus will never be achieved’, the well known paediatricians said. “It was unethical for WHO and Bill Gates to flog this programme when they knew 10 years back that it was never to succeed. Getting poor countries to expend their scarce resources on an impossible dream over the last 10 years was unethical,” said Dr Neetu Vashisht and Dr Jacob Puliyel of the Department of Paediatrics at St Stephens Hospital in Delhi in their report in the April issue of ‘Indian Journal of Medical Ethics’. January 12, 2012, marked a significant milestone for India as it was the first anniversary of the last reported wild polio case from India. Dr Vashisht and Dr Puliyel said that another major ethical issue raised by the campaign is the failure to thoroughly investigate the increase in the incidence of non-polio acute flaccid paralysis (NPAFP) in areas where many doses of vaccine were used. NPAFP is clinically indistinguishable from polio paralysis but twice as deadly. Monovalent Type 1 Poliomyelitis Vaccine, Live (Oral)/mOPV Type 1: DESCRIPTION (Substrate – Monkey Kidney Cells) The live monovalent Oral Polio Type 1 Vaccine (mOPV Type 1) contains suspension of live attenuated poliomyelitis type 1 virus (Sabin strain) prepared in Monkey Kidney cells. Each dose contains not less than 106.0CCID50 virus concentration of type 1. MgCI21M is used as a stabilizer and phenol red as an indicator. During formulation of mOPV Type 1 trace amounts of antibiotics: Kanamycin & Neomycin Sulphate are added. Manufactured by Panacea Biotec. Monovalent Oral Polio Type 1 Vaccine (mOPV Type 1)/mOPV Type 1: DESCRIPTION (Substrate – Vero Cells) The live monovalent Oral Polio Type 1 Vaccine (mOPV Type 1) contains suspension of live attenuated poliomyelitis type 1 virus (Sabin strain) prepared in Vero cells. Each dose contains not less than 106.0CCID50 virus concentration of type 1. MgCI21M is used as a stabilizer and phenol red as an indicator. During formulation of mOPV Type 1 trace amounts of antibiotics: Kanamycin & Neomycin Sulphate are added. Manufactured by Panacea Biotec. What is the REAL smoking gun behind the so-called decline in numbers of Polio Paralysis/Infantile Paralysis in the Third World, officially attributed to the Globalist financed Polio Mass Vaccination (aka Eugenics) Programs? The World Health Organization (WHO) have deliberately focused merely on identifying cases of the standard Wild Polio Virus/WPV strain (Types 1, 2 & 3) – itself the by-product of diseased African Green Monkey Kidney (Simian Virus 40/SV40) inter-generational cross-contamination from the original Salk Polio Vaccine(1955); while failing to acknowledge that, in fact, their recommended live monovalent Oral Polio Type 1 Vaccine (mOPV Type 1), which contains suspension of live attenuated poliomyelitis type 1 virus (Sabin strain) prepared in Monkey Kidney cells, has spawned a new, virulent hybrid of Polio, known as ‘Non-Polio Acute Flaccid Paralysis (NPAFP), throughout the Second & Third World ‘…while India was polio-free in 2011, in the same year, there were 47500 cases of NPAFP.‘; including cross border transference of Non-Polio Acute Flaccid Paralysis type Polio through inevitable post-immunization community wide viral shedding. The same cross-contamination, hybrid Polio strain will concurrently be passed on, generation to generation, throughout impoverished areas, embedded in the baby’s genetic DNA material, via the mother’s placenta & colostrum. Why is this issue so important? Because Polio has become the Vaccine Industry’s flagship model of so called progress, and an argument perpetually used in favor of imposing vaccine uptake on the general population. The Western Medical Establishment & those who still trust in that system for answers, always look to their having “conquered” Polio as a benchmark justifying Herd Immunity type Immunization, in terms of succeeding where nature, left to its own devices, would have inevitably failed us. They have now adopted a “case closed” approach to Polio in India & elsewhere, despite the exponential surge in numbers occurring throughout the Third World. The truth is, Malaria NOT Polio, has always represented the single greatest threat to survival in the poorest regions throughout the Third World – and the locals everywhere know it. ‘A third of malaria drugs used around the world to keep the spread of the disease at bay are counterfeit‘…“In Africa polio does not kill anybody and they say it’s very rare to catch. It’s really very rare to get paralytic polio. They say it’s in very rare circumstances, so what is it that is killing people in Africa? Malaria. Every five seconds a child is dying of malaria in Africa. Now to get the dose of life-saving anti-malaria is about $5 but there is no government to give anti-malaria.‘ But instead of providing high quality, safe & efficacious Malaria treatment, community access to clean water, holistic dietary improvements ie. growing local natural food sources, and the independent means to sustain that infrastructure, The World Health Organization, CDC, NIH, all Government run Health Departments & those wealthy Philanthropists who have jumped on the bus & wrapped themselves around the same flag, are all fervently pushing the Polio Mass Vaccination Program on the Third World as some great savior and answer to our prayers. The WHO and all their Corporate Mainstream Media minions pushing Vaccine propaganda on the public, have, in fact, betrayed our communities, betrayed the Third World, and literally re-invigorated Polio, having spawned a new, virulent hybrid of Polio, known as ‘Non-Polio Acute Flaccid Paralysis (NPAFP), throughout the Third World via cross-infection & viral shedding, stemming from the original Salk Polio vaccine formula; contaminated with diseased African Green Monkey Kidney virus (Simian Virus/SV40), the follow-up Sabin formula (including the sugar cube version); and subsequently on their recommended live monovalent Oral Polio Type 1 Vaccine (mOPV Type 1), which contains suspension of live attenuated poliomyelitis type 1 virus (Sabin strain) prepared in Monkey Kidney cells – which is now being forced on hundreds of thousands of children, otherwise symptom-free from Polio. 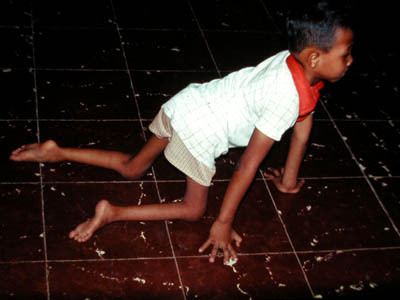 During 2011, incidence of Non-Polio Acute Flaccid Paralysis (‘clinically indistinguishable from polio paralysis but twice as deadly‘) in India, alone, sky-rocketed to 60,754 cases; coinciding with the culmination of the most intense, widespread phase ever conducted in India’s Oral Polio Vaccination “reaching every child” campaign. While meanwhile the WHO have conveniently removed India from the list of Polio endemic countries; because they’re not looking for a Polio hybrid in the first place. Since the Global Polio Eradication Initiative (GPEI) was launched in 1988 (spearheaded by national governments, the World Health Organization/WHO, Rotary International, the US Centers for Disease Control and Prevention/CDC & UNICEF, supported by key partners including the Bill & Melinda Gates Foundation), India has seen an exponential surge, year to year, in cases of Acute Flaccid Paralysis (AFP), in direct correlation to the increased intensity of Polio immuniozation being conducted on the ground throughout India’s many provinces. Year & corresponding AFP Cases reported (India): 2001 – 7470, 2002 – 9705, 2003 – 8508, 2004 – 13269, 2005 – 27049, 2006 – 32194, 2007 – 41524, 2008 – 45585, 2009 – 50405, 2010 – 55785, 2011 – 60754. ‘The number of polio cases worldwide dropped to its lowest recorded point last year, but the campaign to eradicate the virus could be undermined by regional conflict and a funding shortfall, the World Health Organization has warned. Only 537 cases of polio, an infectious disease that mainly affects children under 5, were reported in 2001, down 82 percent from a year earlier, when the number was 2,979, the United Nations agency said. 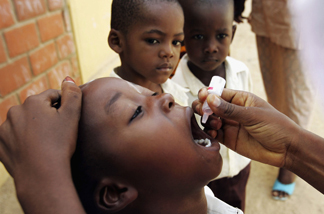 It also reported that the number of countries reporting continued polio transmission was cut in half, to 10. The health organization began its campaign against polio in 1988, when it still cut a swath through more than 125 countries, paralyzing children at the rate of 1,000 every day. The group says it aims to eliminate polio by the end of this year and certify the world polio-free at the close of 2005. ‘In 2007 number of (Polio/OPV) vaccination rounds were increased to one round every month, but in 2007 number of polio cases increased further. In 2005 there were 66 polio cases whereas in 2006 and 2007 number of polio cases increased to 676 and 863, respectively. Some mutations in polio viruses may be responsible for development of resistance to antibodies generated by OPV and a reason for the recent steep rise in polio incidence since 2006. Because of these two factors, OPV cannot eradicate polio from India.’ Maharaja Agrasen Hospital, Paediatrics, Vidhyadhar Nagar, Jaipur, India. ‘Salk cultured live Polio virus in diseased African Green Monkey kidneys (SV40 Patent). It was supposedly attenuated with formaldehyde & the heat treatment process to render the virus safe from harm. History has proven their method was far from foolproof as the virus component was not sufficiently “killed off”. Based on my understanding the problem was never fixed. ‘Some 50 to 65 monkeys will be used in a single morning. Under an anesthetic a surgeon removes the kidneys, after which the monkey is killed by an overdose of ether. Then the kidneys are cut into tiny pieces and placed in glass bottles with a special nutrient solution (No 199) devised by Dr. Salk. These bottles are then rocked in a mechanical machine for six days in an incubator to stimulate the growth of the kidney cells. As we have already seen, there are three main strains of polio virus, against all of which there is need for protection. Consequently three tankfuls each containing one type of virus, cultivated and killed in the above manner, are mixed together. After neutralising the formaldehyde with sodium bisulphite there begins a month-long process of testing to see if the vaccine is safe for injection into human beings. This necessitates inoculations into live monkeys, rabbits, guinea-pigs and mice. These tests are carried out simultaneously, on each batch issued, by Dr. Salk’s laboratories and by the National Institute of Health at Bethesda, Maryland. Having passed the final tests the vaccine is distributed in little glass bottles for inoculation into children. The majority of the cases followed inoculation with the Cutter brand of the Salk vaccine, but the subsequent reports of laboratory tests were at first conflicting: The Minister of Health declared, in answer to a question in the House of Commons (June 17. 1955). that “No explanation for the Cutter vaccine incident has yet been found, but it is possible that certain batches contained live virus.” The Lancet (June 11, 1955. p. 1207) stated in a leading article that “the most likely explanation is that some of the vaccine contained live poliomyelitis virus which had not been completely inactivated by the formaldehyde treatment.” At any rate, in contrast to one report speaking of failure to isolate the virus from the Cutter vaccine- a purely negative laboratory result- –a more convincing report by Dr. Louis P. Gebhardt. Professor of bacteriology and Director of poliomyelitis Research Laboratory in the University of Utah, asserted that he had found live virus in samples of Cutter vaccine. This was confirmed by Dr. Scheele in a statement on television. It was also revealed in this report that several of the six manufacturers licensed to make the Salk vaccine had the daunting experience of finding active virus-—in one instance in four out of six batches tested– –in the vaccine, when it should have been safe and ready for use. The explanation of this somewhat startling pronouncement is to be found in a statement made by the city health commissioner of Milwaukee. Wisconsin, in May 1955, when referring to the safety tests made on monkeys. He said: ” Monkey tissues are not necessarily comparable to human tissues in this respect. This is exemplified by the fact that the amount of inactivated virus necessary to produce a good polio anti-body response in humans is far less than that needed in monkeys.” In other words the monkey is not so sensitive in the presence of virus as is the human being. Polio was on the decline well before the vaccine program was introduced. That quickly changed however with a rapid spike in numbers in 1954. ‘1954 Polio rate caused by the vaccine accelerates ten-fold in Massachusetts. According to the ACS, they are predicting 6.4 million deaths from cancer, compared with 128,000 in 1933 – an increase of 6.2 million cases in 22 years. Vaccination, pesticide use and chemical pollution are the main factors that have increased since 1933. 1955 Idaho brings its Salk vaccination program to a halt on July 1, 1955. Utah does the same on July 12, 1955. 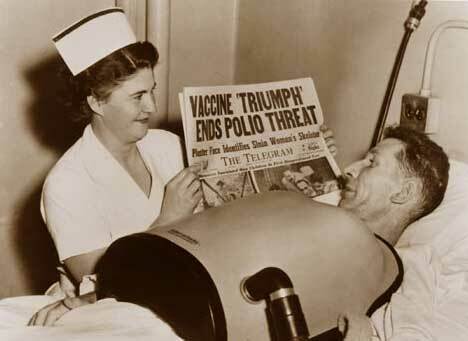 1955 Vermont reports a 266% increase in polio since vaccinations began in 1954. 1955 Rhode Island reports 454% increase in polio since vaccinations in 1954. 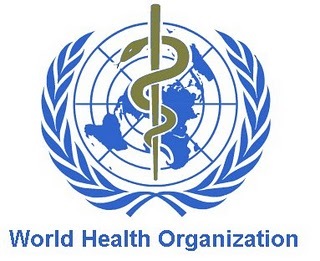 The United Nations, which overseas the World Health Organization (WHO), has been implicated in the promotion of live viruses & eugenics-type sterilization programs throughout the past, based on verifiable data. It followed a 1972 report (Bulletin #47) issued by the World Health Organization which referred to an immune virus requested which would selectively destroy the Human T Cell System, to be distributed in conjunction with a Nationwide vaccination program “to observe the results”. This coincided precisely with the extensive Small Pox vaccination program in central Africa – shortly preceding the outbreak of Aids in Africa, America & elsewhere. The determining factor most common in Aids victims is the breakdown of the T Cell System in the body. Another coincidence. There is some research that indicates these old vaccines the baby boomers got from 1953-1963 are responsible for many of the cancers we have today – called the Baby Boomer Cancer. This may be why in the US today, you are not ‘sick’ unless you have cancer. Also, gearing up for huge increases in hospitals for same. Maybe most if not all cancers are viral, hiding behind the accumulated heavy metals in the body.